Using the palm of your hand, rotate the nozzle turret counterclockwise to the left stop to complete any interrupted rotation cycle (Fig. 2). Insert the plastic key end of the Hunter wrench into the adjustment socket (Fig. 3 & 4). Adjust to any arc between 40° and 360° (Fig. 5). The wrench will stop turning, or there will be a ratcheting noise, when the minimum arc of 40° has been reached. Insert the steel hex end of the Hunter wrench into the radius adjustment screw (Fig. 6). Turn the screw clockwise (into the stream of water) to decrease the radius, or counterclockwise to increase the radius. Radius can be reduced up to 25%. 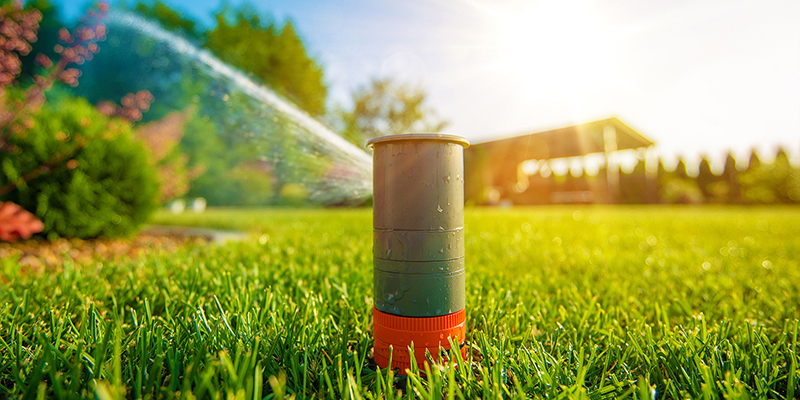 If you have excessively wet or dry areas, you can change the nozzle in the sprinkler to increase or decrease the precipitation rate. For dry areas, install a larger nozzle. For wet areas, install a smaller nozzle. Insert the plastic key end of the Hunter wrench into the lifting socket of the sprinkler and turn 90°. Pull the riser up to gain access to the nozzle socket (Fig. 8). Using the hex key of the Hunter wrench, turn the radius adjustment screw (Fig. 6) counterclockwise to be sure it is not blocking the nozzle socket opening. If a nozzle is already installed, it can be removed by backing out the adjustment screw and turning on the water, or by pulling outward on the nozzle “ears” with a pair of needle-nosed pliers. Slip the desired nozzle into the nozzle socket (Fig. 7). Note that the socket is angled up 25°. The “ears” should be adjusted so that the nozzle range screw threads directly down between them. Then tighten the nozzle range screw. The raised bump with an arrow on the rubber cover will always indicate the location of the nozzle and direction of water flow when the sprinkler is retracted. If the right side of the arc is not properly aligned, the results may be a wet walkway or a dry turf area. The right side arc can easily be realigned. One way to realign the right stop is to turn the whole sprinkler body assembly and the fitting below it, left or right to the desired position. This may require temporary removal of the soil around the sprinkler to allow you to grip the sprinkler housing. Another way to reset the right arc is to unscrew the body cap counterclockwise and remove the internal assembly from the body. Once removed, rotate the nozzle turret to the right stop, screw the internal assembly back into the body with the nozzle aligned to the right side of the area you want irrigated (Fig. 9). At this point you have realigned the right arc stop, and you can adjust the left arc to an appropriate setting. Note: It is not necessary to dig up and remove the whole sprinkler to realign the right arc.